The femoral stem is made of metal (usually a Titanium or Cobalt Chrome alloy or stainless steel). The head is made of ceramic or metal. 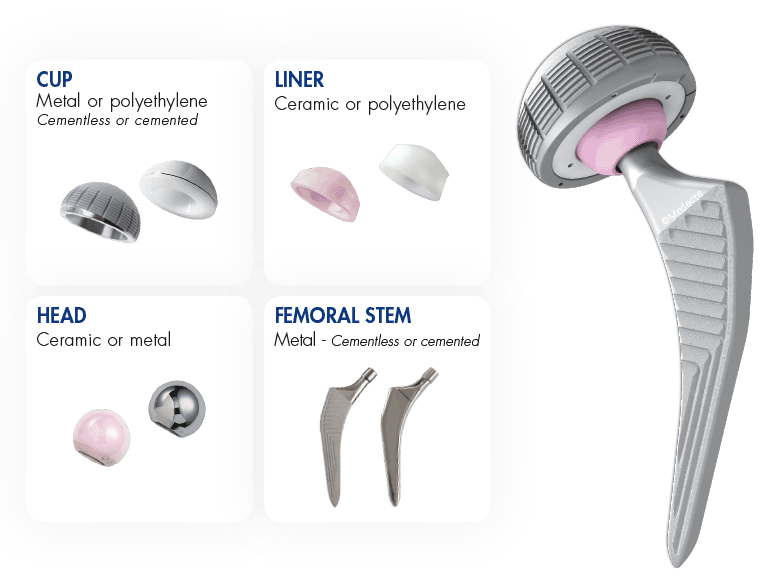 The cup consists of 1 or 2 pieces, depending on the procedure: cemented (usually only one component of polyethylene) or cementless (metallic acetabular shell and liner). In the case of a metallic acetabular shell a ceramic or polyethylene liner articulates against the head. All the materials used for hip arthroplasty are highly biocompatible. Your hip will function with less effort, almost regaining your original mobility.